Following a larger than expected win in New York, Hillary Clinton’s campaign has come to amass a nearly insurmountable delegate lead over Bernie Sanders. As the graph below shows, Sanders needs to win roughly 59 percent of all remaining pledged delegates to squeak out a majority among pledged delegates by the end of the nomination process. Graph indicating share of remaining delegates that each candidate needs to win a majority of pledged delegates. 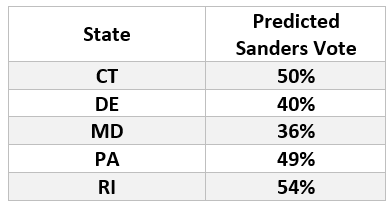 Delegate predictions for April 26th states based on current polling averages. That delegate climb is set to become even steeper after primaries this Tuesday in five Northeast states: Connecticut, Delaware, Maryland, Pennsylvania, and Rhode Island. 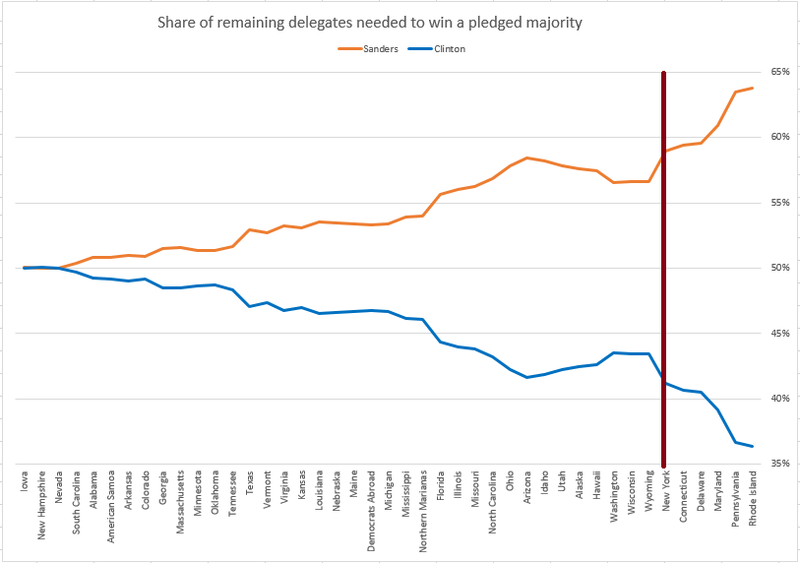 All expectations are that Clinton will grow her delegate lead over Sanders significantly, meaning that after Tuesday he will need to win roughly 64% of all remaining pledged delegates to even bring Clinton to a draw in pledged delegates [And this doesn’t begin to factor in Clinton’s roughly +440 lead among Superdelegates]. Given these structural disadvantages for Sanders, is there any silver lining for the candidate? If there is, it is to prevent Clinton from sweeping all five states on Tuesday. By far his best chance to accomplish this will be a win in Rhode Island. In many respects, Rhode Island is a state tailor-made for Sanders. The state’s electorate has a disproportionate number of white men, particularly non-college educated white men, and has among the smallest African American electorates in the country. Importantly, Rhode Island is also an open primary, in which unaffiliated voters can choose on Election Day whether to participate in the Democratic or Republican primary. To put into context what the means for the makeup of the electorate, while 76% of all Democratic primary voters self identified as Democrats nationally in 2008, only 64% of voters did so in Rhode Island. For comparison, the closed New York primary this week had among the highest proportion of voters in the country that self identify as Democrats. So what do the polls look like in Rhode Island? Well, as luck would have it, there hasn’t been any polling in the state — perhaps not a surprise given the small number of delegates available under proportional allocation. So to help give some guidance as to what we should expect, I built out a model using a set of predictors from past Democratic primaries. Those predictors include: percentage of white men, white women, African Americans, self-identified Democrats, self-identified Liberals, and non-college white voters in the electorate. 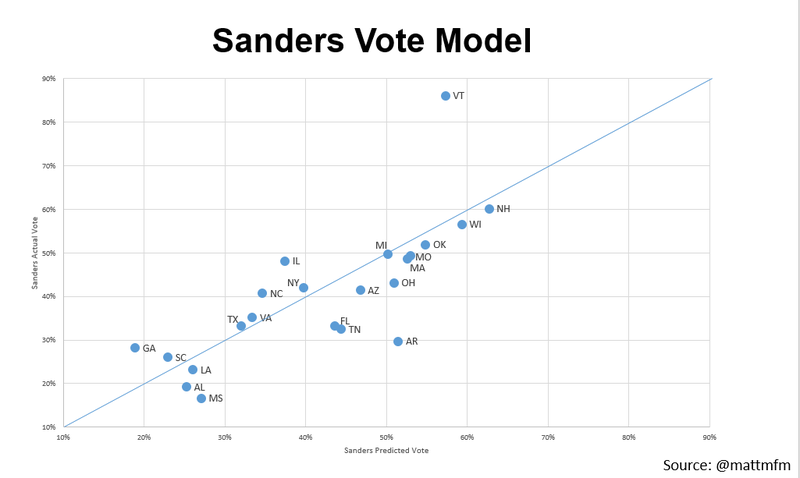 As you can see, the model has performed pretty well in predicting Sanders’ vote in the states that have voted thus far. In fact, it nailed the “surprising” win in Michigan. It was off the furthest in Vermont, unsurprising given Sanders’ home state advantage, and Arkansas. So what can we expect on Tuesday? The model predicts Sanders should have about an 8-point lead in Rhode Island, with 54% of the vote. After Rhode Island, his next best state is Connecticut, where he’s roughly tied in the model with Clinton. His slightly weaker performance in Connecticut is due to the fact that, like New York this week, it is a closed primary. Sanders is weakest in the states with high percentages of African American voters, which includes Maryland and Delaware on Tuesday. But even if Sanders pulls off a win in Rhode Island, it’ll be nearly impossible for him to net the margin needed to remain on track for the nomination. 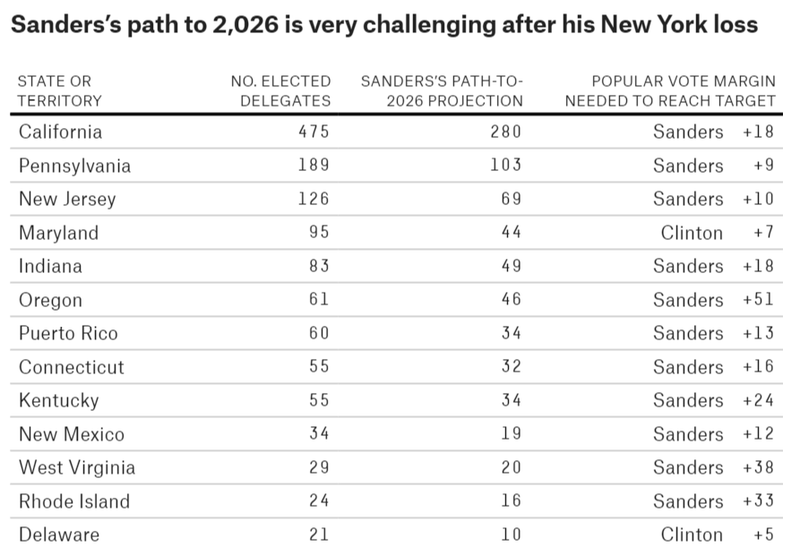 As Nate Silver calculated earlier this week, Sander’s path to 2,026 (a majority of pledged delegates) requires him not just to win Rhode Island, but beat Clinton in the state by 33-points. I’ll take the under on that bet.